i think i first heard about project life on ali's blog. then, i saw that elise and kelly were giving it a go this year and thought it looked really fun. sadly, the main page protectors were sold out, so i was going to have to wait for a while. but then kelly came to the rescue! she sent me a few page protectors, so i was able to go back and fill in january and get started on february. i love it so much already!! can hardly wait to see how the year unfolds. and i am especially excited to be documenting olivia's first year. it was fun to print off instagram shots in different sizes to add to the pages. and i'm always up for dipping in to my washi tape supply to pretty things up. i purchased the clementine core kit, but i'm also looking forward to using some of my paper supply, like that pretty aqua one from paper source. i made these weekly title cards in photoshop after seeing something similar on katrina's blog. thank goodness for my iphone! aside from taking daily shots with instagram, i'm loving taking screen shots of facebook, twitter and other apps. they are the perfect little size to print off and fit in the small pockets (although, that twitter pocket is a screen shot from the laptop). i'm also printing off tv show posters and book covers to remember what we were watching and reading throughout the month. detail of an anthropologie price tag and gift card on top of patterns that i found online and printed off on card stock. i need to find a better spot to take photos of my pages, though. my apartment is so dark in the winter. 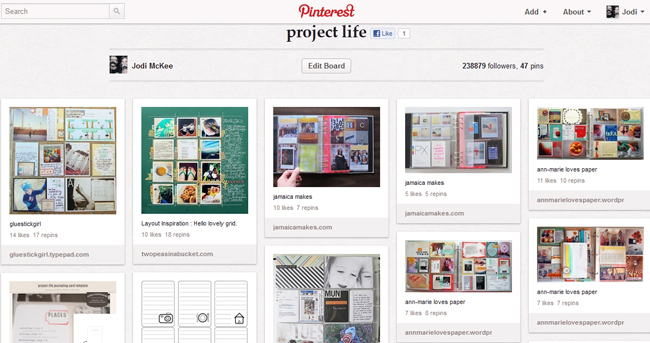 i am completely in love with these printed off screen shots of pinterest. in LOVE i tell you. project life is awesome. if you've been thinking about starting it, do it! you won't regret it. promise. and if you need more inspiration, i've been pinning pages that i like and i even made a little treasury on etsy of fun products to add to your book. enjoy!